ANTRIM’S response to their four-point defeat to Louth in the Division Four final on Saturday will prove the first real test of the squad’s mentality, according to captain Kevin Niblock. The Saffrons earned promotion and qualified for last weekend’s decider in Croke Park with a seven-game unbeaten run throughout their Division Four campaign, which included a round seven draw with the Wee County in Corrigan Park. Antrim had taken a four-point lead into the break, thanks largely to Matthew Fitzpatrick’s goal just before half-time but were unable to withstand a spirited Louth comeback with Conor Grimes scoring the match-winning goal in injury-time. The resolve of the Antrim squad will be tested by the defeat, their third National League loss in eight years following back-to-back defeats to Sligo in 2009 and 2010. However, Niblock is hoping the squad can bounce back in time for their Ulster Championship clash with Fermanagh on Sunday, May 15. “Hopefully it won’t affect us too much,” said Niblock. “That would be the obvious thing. We will be going in as underdogs against Fermanagh. “The next three weeks will tell if this is the new Antrim or not. “Everybody has been talking about having a great year and moving on from the past. We felt like we have done that. “It is crucial that we respond as a squad over the next few weeks. 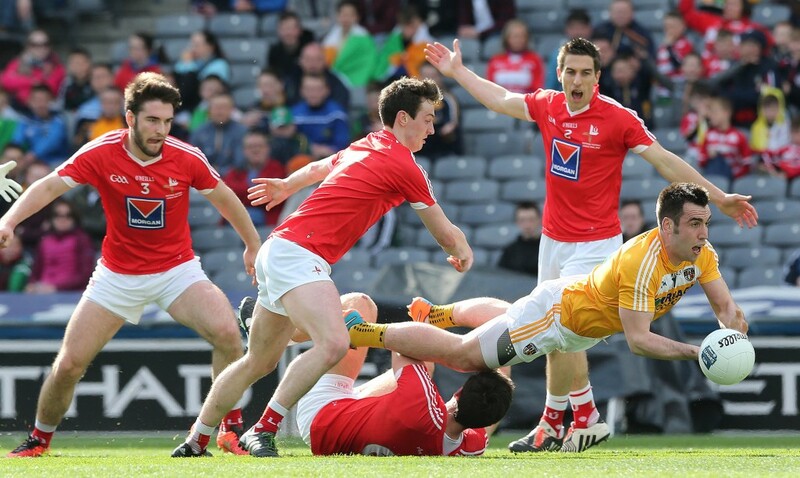 The unfamiliar surroundings of Croke Park proved an unforgiving arena for the Saffrons. Louth’s pace and power overwhelmed Antrim at times as the Ulster side went more than 20 minutes without scoring in the second half. Niblock felt Louth punished Antrim more than other opponents have done so far this season. “It was a bit like all year, we played in patches and teams hadn’t punished us whereas Louth did,” added the St Gall’s attacker. “They took their goals well and deserved the win. There was a period of 10 or 15 minutes when myself and a few others missed shots and I think that we have plenty of work to do on our psyche. “It went very flat. Both sides hit plenty of wides but they got their goals at great times and we didn’t react as we should have. “We need to find that consistency but I don’t want to be too negative either.